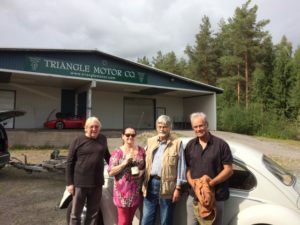 Beetle lähtee Saksaan – Triangle Motor Co.
Elokuun lopussa viimeinenkin keväällä järjestetyssä ajoneuvohuutokaupassamme uuden omistajan löytänyt auto lähti uuteen kotiinsa. Paikalla olivat sekä auton uusi että vanha omistaja, ja kieltämättä hetki oli tunteikas. Oli hienoa olla todistamassa Beetlen luovutusta. 12th of May I participated at your car auction. A Finnish friend of mine was here and he bought finally a 1965 Beetle for me. I made my bids by telephone. I had seen the car only on photos in the internet and was very pleased to see the car in the end of August when I picked it up from Triangle Motor. The car was owned more than 50 years by a lady. She lives 70 km away from Alastaro and came with her husband to see the buyer and the last time her car. Photos have been made and she was happy to see her car in German collectors hand. It was very emotional. I was positively surprised in regard of the shape of the Beetle. It was almost in 1st paint, all original with full history. The vehicle was exactly in the condition Triangle Motor described it. I have collected cars since 1974 and own about 55 collector cars at this moment. Beetle lähdössä uuteen kotiinsa. Kuvassa vasemmalta oikealle: Joachim, Soile, Pekka, Hermann.